Fruitless Pursuits: Boss Monster vs. Pixel Lincoln! A few weeks ago I received a wave of tweets, emails, and texts telling me to check out Boss Monster on Kickstarter. Why the onslaught of inward communication? Because a few months ago I launched Pixel Lincoln, and this was another pixel styled side-scrolling card game. But my first thought wasn't to panic... instead I wanted to play the game. It looked really cool. The creators generously sent me a preview copy to show the differences, which I'll outline below. But first… what is Boss Monster? 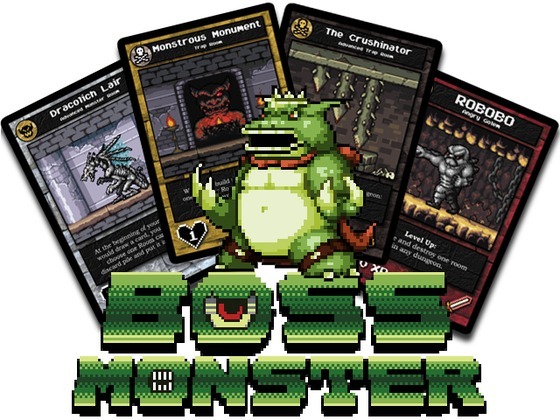 Boss Monster is a standalone card game that challenges 2-4 players to become videogame-style villains and build deadly side-scrolling dungeons. Players compete to see who can lure and destroy the most adventurers. But beware! You must make your dungeon as deadly as it is attractive, or the puny adventurers might kill you first! Are you a bad enough dude to become the ultimate Boss Monster? I've played through the game a few times now, and we've had a LOT of fun. My group is very heavy into classic video games, so that mindset definitely influenced how much they loved the game, but I assume you would be into classic games to be drawn into this in the first place. I can't speak of the other side, because classic video games have been a part of my life forever. I rarely play video games that were made in this century. What makes this game so fun is that you play as the Boss (who is always cooler than any of the main characters). Each varies quite a bit in style, and each has a special power. But my favorite part is that you build a dungeon. You will strategically place cards from right to left, luring in adventurers. Each card adds treasure to lure them in, but they also add special abilities like "Destroy this room: Kill a Hero in this room". And that's exactly what you want to do. Kill the heroes before they reach you. If they reach you, you'll take a wound. If you kill them, you keep them as a prize. So what is similar about the Boss Monster and Pixel Lincoln? There are three obvious similarities. -Both games feature pixel art - Pixel Lincoln's art is almost all character art. Boss Monster's art is character art with scenery. -Both games sidescroll - In Pixel Lincoln, each player moves throughout the level from left to right, eventually reaching the final boss. In Boss Monster, the adventurers move from left to right as well, eventually reaching you, the final boss. -Both games mock the classic NES style cover art. 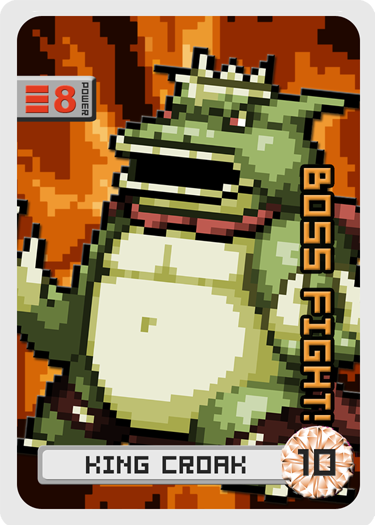 - Boss Monster uses it for the main box art. Pixel Lincoln uses it in the level tuck boxes. It's that classic black box in the same style as Excitebike. Now there are a ton of differences between the two games since they play very differently. You can see some at a glance, and the others you'll feel when playing the games. -Pixel Lincoln uses deckbuilding as its base. You are obtaining cards to use and re-use. But Boss Monster uses dungeon building as its base. Players create their own levels and for the most part, once a card is used, you do not use it again. This creates a very different type of game. -Hero/Boss - I've heard Boss Monster referred to as reverse Pixel Lincoln. You play as the Boss instead of the Hero. This is probably the biggest difference because it shapes the tone and feel of the game. As a Boss you want to create a tough dungeon to destroy the adventurers. In Pixel Lincoln you hope that you don't end up with a tough level, so you can survive until the end. In that aspect they are complete opposites. But there is more to each game that shows that they have nothing to do with each other. In Boss Monster there is an initiative phase where you are trying to lure the adventurers to choose your dungeon. In Pixel Lincoln there is a hand management phase where you see what's coming and set yourself up for the next round. And while both looking 8 or 16 bit, they vary quite a bit in theme. Boss Monster is very classic dungeon game, with video game references on its cards (Robobo is wonderful) and Pixel Lincoln is more of a Mario/Megaman style game that references the era in its layout and mechanics, and meat references on its cards (Sausage Link Whip, Muttonstar). Ultimately they are completely different games. They look quite different and play completely differently, but they will probably both appeal to the classic gamer crowd. And since we share a few common threads, we thought it would be awesome to combine our worlds together. Boss Monster (which just passed $100,000 on Kickstarter - massive congratulations to Brotherwise Games) is including Pixel Lincoln as an Epic Hero card if they hit $130,000. 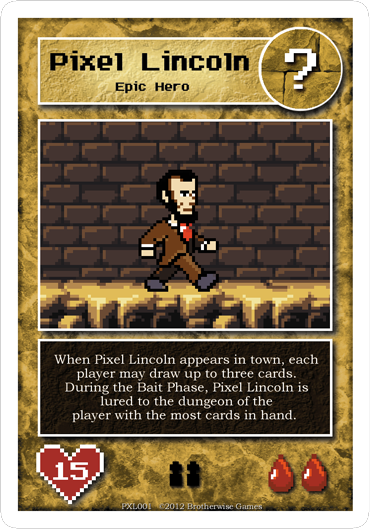 And in Pixel Lincoln, we're making a King Croak boss card. We'll release details on its release and soon as they are ready. We're just hitting the production phase, so it'll likely be with our next release or promotion. Keep an eye out for details. I'm so waiting for this game ! Hoping it will be translated too.